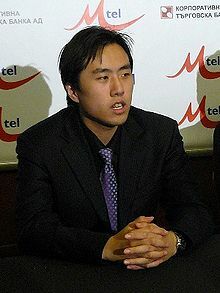 Bu Xiangzhi (Chinese: 卜祥志; pinyin: Bǔ Xiángzhì; born December 10, 1985) is a Chinese chess grandmaster and Chinese champion in 2004. He was a member of the gold medal-winning Chinese team at the 2015 World Team Chess Championship. In 1999, he became China's 10th Grandmaster at the age of 13 years, 10 months, 13 days, at the time the youngest in history. In April 2008, Bu and Ni Hua became the second and third Chinese players to pass the 2700 Elo rating line, after Wang Yue. Bu was born December 10, 1985 in Qingdao. At age six, Bu was first introduced to chess by an elder cousin (his grandfather was a strong xiangqi player), and his interest grew with his compatriot Xie Jun's women's world championship victory in 1991. He began taking chess seriously at the age of nine years and received early training from then on. During this time, the Qingdao Daily newspaper founded a local chess club which many children in the city went to, including the Qingdao Daily's chief editor's son. His first chess book was a translation of the famous My 60 Memorable Games by Bobby Fischer, a player Bu admires. By 1993, he had already won the Qingdao Junior Chess Championship. In 1997 this talent became the Children's Champion of the National S.T. Lee Cup. In 1998 at the age of 12, he captured the titles of National Pupil Champion and Under-14 World Youth Champion. In 1999 he finished seventh in the prestigious Tan Chin Nam Grandmaster Invitational Tournament. A sponsor's contract with a mineral water producer of his home city Qingdao enabled to him in 1999 with his coach Ji Yunqi to travel to Europe to take part there in several international chess tournaments. In autumn 1999 he achieved within only two months three Grandmaster norms, with tournament wins at the 21-29 September Paks GM (Category 10) tournament (6/9 points) and 3-13 October Kluger Memorial Budapest First Saturday (Category 7) tournament (8½/11 pts), and coming joint first in the 18-23 October Qingdao Daily Cup (6/8 pts). He was 13 years 10 months 13 days old when he scored the final norm, at the time the youngest person to achieve that title. He gave up the running status of the world's youngest Grandmaster to Sergey Karjakin in July 2002. Also in 1999 he won the German Open. In 2000 in Germany he won in his first appearance the International Neckar Open in Deizisau, Stuttgart. Also in 2000, Bu defeated the Azerbaijani chess talent Teimour Radjabov 6½-1½ in an eight-game Future World Champions Match competition in New York. They played two games a day at a time control of one hour for all the moves. The margin of victory was a little flattering to Bu with Radjabov missing a number of good chances on the first day and then having a bit of a disaster on day two losing both games. Radjabov had beaten Bu in the two game final of a Cadet's event held earlier in the year on the Kasparovchess.com site. In May 2000, Bu made his first appearance in a United States Chess Federation-rated tournament at the New York Open in New York City. Although one of the favorites to win the tournament, he lost in the first round to American life master Shearwood McClelland III in an upset, before rallying to finish with 5½/9. In December 2003, Bu won the 10th Aceimar International Open in Mondariz with 7½/9. In November 2004, he became National Chess Champion of China in Lanzhou with a score of 9.0/11. In 2006 Bu won the 9th World University Chess Championship in Lagos, Nigeria on tiebreak over Ni Hua, after they both scored 7.5/9. In July 2007, Bu won the Canadian Open Chess Championship in Ottawa, Canada. In October 2007, he won the Blindfold Chess World Cup in Bilbao by a 1½ point margin, defeating strong Grandmasters Veselin Topalov, Magnus Carlsen, Pendyala Harikrishna, Judit Polgár and Sergey Karjakin in the process. In January 2008, at the 6th Gibtelecom Chess Festival in Gibraltar, Bu came joint first scoring 8.0/10 (+7−1=2; Elo performance 2834) but lost on the two game blitz play-off tie-break to Hikaru Nakamura. In April 2008, Bu competed at the Russian Team Championships in Dagomys, Sochi for the team Shatar-Metropole (Buryatia), where he achieved a score of 6½/10 (+3−0=7) and a performance rating of 2771. In his super-tournament debut in Sofia, Bulgaria at the Grand Slam M-Tel Masters (Category 20) tournament on May 7-18, 2008, he came fifth out of six players (Levon Aronian, Ivan Cheparinov, Vassily Ivanchuk, Teimour Radjabov, Veselin Topalov) having scored 3.0/10 (+1−5=4; Elo performance 2594). He competed at the Inventi Grandmaster Tournament in Antwerp, Belgium on 23-31 August 2008. He won the tournament with a score of 7.0/9 (+5−0=4) and a performance rating of 2748. In September 2008, he competed at the 5th Russia v China Match in Ningbo where he scored 2½/5 with a performance rating of 2707 for the men's team (with Wang Yue, Wang Hao, Ni Hua, Li Chao). In October Bu won the men's rapid individual tournament of the 2008 World Mind Sports Games. In December 2008, he came third out of six at the Pearl Spring chess tournament in Nanjing with 5.0/10. He scored 6½/9 (+4−0=5) at the Moscow Open in January with a 2723 performance. 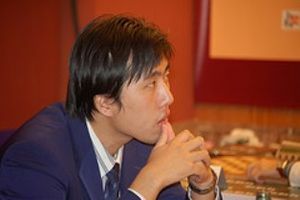 Bu Xiangzhi scored 5½ (+3−1=5) at the 2010 Aeroflot Open finishing in 10th place out of 80 players with a 2700 performance. Following this tournament, he scored 13.0/18 in the Preliminaries of the 2010 World Blitz Championship Preliminaries on February 18 to finish in second place behind Maxime Vachier-Lagrave; the result automatically qualified Bu for the 2010 World Blitz Championship to be held in Moscow in November 2010. From May 24 through June 4, 2010, Bu participated in the Chinese Chess Championship. In clear first after ten rounds, Bu needed a final round victory to secure his second Chinese chess championship. However, he drew his final round, allowing Wang Hao and Zhou Jianchao to catch him with 7½/11; Wang won the championship on tiebreak. Bu participated in the 1st Danzhou Tournament in China from June 11 through June 20. After a victory over Zhou Jianchao, Bu led the tournament with 5½/8 with one round remaining. A final round draw with Hou Yifan allowed Li Chao to catch him with 6/9, but Bu won the tournament on tiebreak with a performance rating of 2740. From August 4 through 15th, Bu participated in the 7th annual China versus Russia match, held in Yinzhou, Ningbo, China. Teamed with Wang Hao, Wang Yue, Zhou Jianchao and Ni Hua, Bu led the Chinese team to victory with 4.0/5 and a 2928 performance rating. In June 2012, Bu won the 3rd Hainan Danzhou GM tournament on tiebreak over Ni Hua and this victory earned him the last spot in the Chinese team for the Istanbul Chess Olympiad. In August 2012, he won for the second time the World University Chess Championship, held in Guimarães, Portugal, with 8/9 (+7−0=2). In 2014 he won the Politiken Cup in Helsingør, Denmark with 9/10, a full point ahead of the field. Bu has played regularly since 2001 in the Chinese national team. With the World Team Chess Championship in 2005 in Beersheba, and with the Turin 2006 Chess Olympiad he achieved on the top board very good results and won individual and team silvers in each event. 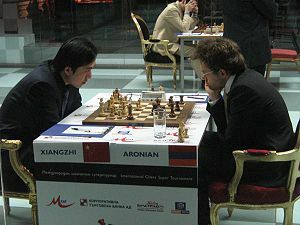 He played first board in Turin, where the Chinese team finished in second place. He won four games and drew eight, including his games against top Grandmasters Vladimir Kramnik, Viswanathan Anand and Levon Aronian. He has played in two previous Chess Olympiads in 2002 and 2004, both on board four. He was part of the team that won silver at the December 2006 Asian Games in Doha. He won an individual bronze medal on board two as the team won gold at the 2008 15th Asian Team Chess Championship in Visakhapatnam. Bu Xiangzhi plays for Shandong chess club in the China Chess League (CCL). Bu Xiangzhi is married to WGM Huang Qian.